Kiev steps up military presence against Moscow invasion of Crimea; Ukrainian Prime Minister offers to begin talks to prevent a war. Acting Ukrainian President Olexander Turchynov has placed the Ukrainian armed forces on "high alert" Saturday night after Russian forces stormed the Crimean peninsula over the weekend, Fox News reports. Turchynov reportedly ordered increased security at nuclear power plants, airports and other strategic infrastructure, because of the threat of "potential aggression" from the Russian troops. Arutz Sheva's Russian-language sources noted Saturday night that the decision follows a warning by Kiev that two Russian ships equipped with anti-submarine measures entered its territorial waters near the city of Sevastopol, in violation of the agreements between the two countries. Ukrainian Prime Minister Arseny Yatsenyuk has also stated that he spoke with his Russian counterpart Dmitry Medvedev, calling for the Russian troops to return to their base in the Crimean peninsula and to begin talks to resolve the conflict. "[Further] military intervention begin a war, and the end the relationship between Ukraine and Russia," Yatsenyuk warned. A Kremlin spokesman said tonight that "Russia hopes that there will be no more escalation." The spokesman, Dmitry Peskov, said that "for now, the president has not made any more decisions" about Moscow's involvement in the conflict. 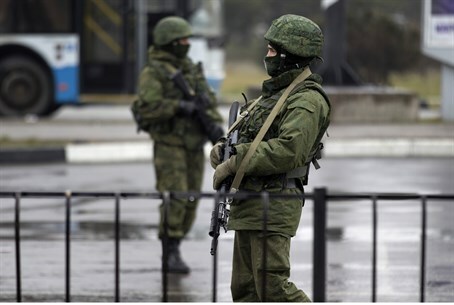 The news is the latest development in the crisis in Crimea, which exploded over the weekend after 6,000 Russian troops invaded an airport in the Russian-speaking Ukrainian province. The UN Security Council is meeting momentarily for talks over the crisis for the second time in 24 hours.